Your Next Stamp October New Release Blog Hop and New Website Launch! Hello and welcome to the Your Next Stamp October New Release Blog Hop! Not only are there new stamps and dies being released today, but Karen has revamped the YNS Website and today is the New Website Launch! You definitely need to check it out! The hop begins on Tracy's Blog and if you've been hopping along, you should have arrived from Maureen's Blog. 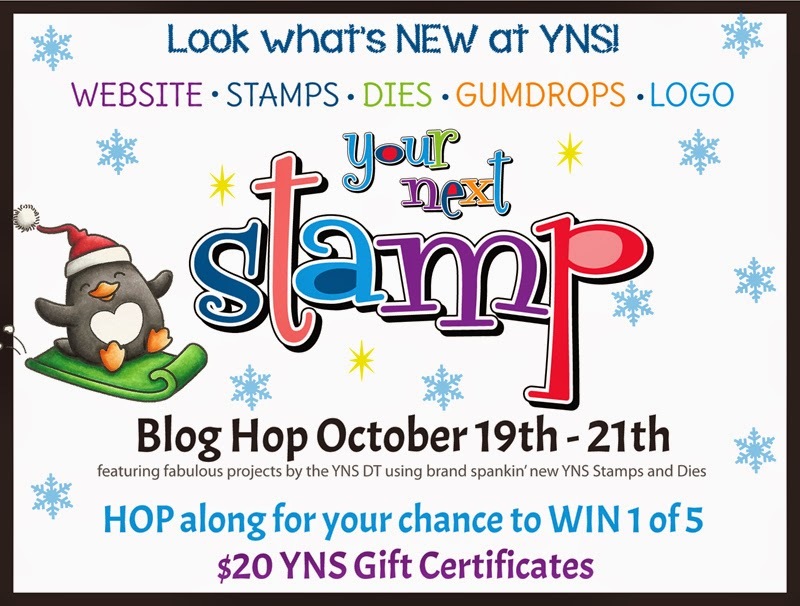 You have until October 21st at midnight EST to hop along for your chance to win 1 of 5 $20 Gift Certificates to spend at the YNS Store!!! The more you comment, the more chances you have to win! For my card today I used the new set Waddles-Snow Fun! This set is ADORABLE!!! I stamped this cute little guy with Memento Tuxedo Black and colored with Copics. I cut him out and popped him up with foam tape. I used one of the fun sentiments from the set and stamped it onto a Fishtail/Banner Die. I also used a snowflake die from the YNS Whatnot Seasons Die Set. I added a Sparkly White Gumdrop to the center and a few more around the card. The dp I used is My Mind's Eye Winter Wonderland. Make sure you set up an account on the new website and you will receive 10% off your entire purchase! Karen is also offering 15% off the new products! Love this card! Your coloring is fabulous! super cute, such a fun guy! Great acrd I love the colours and the paper is awesome as well!!! Too stinken cute!! 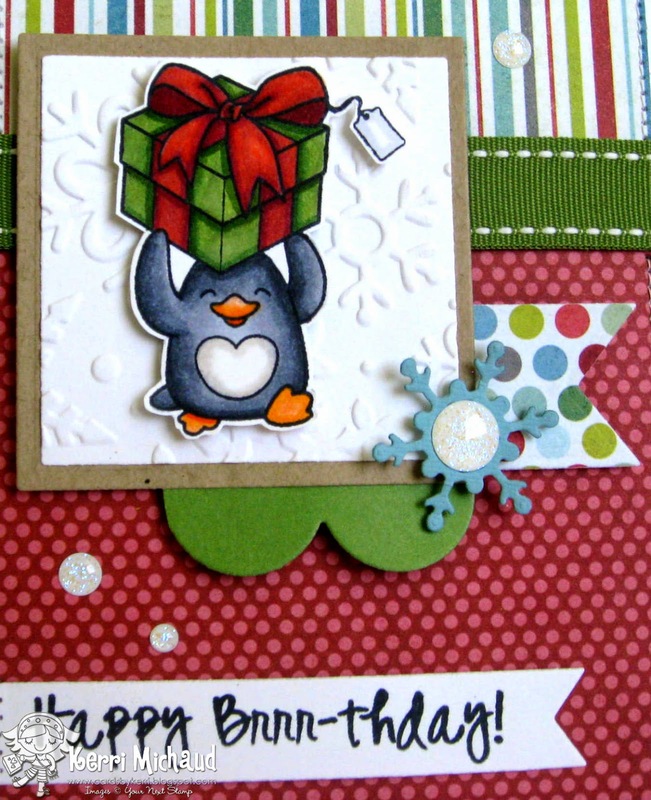 Love the papers & embossing behind that cute little penguin! This penguin just makes you want to smile - great creation!! 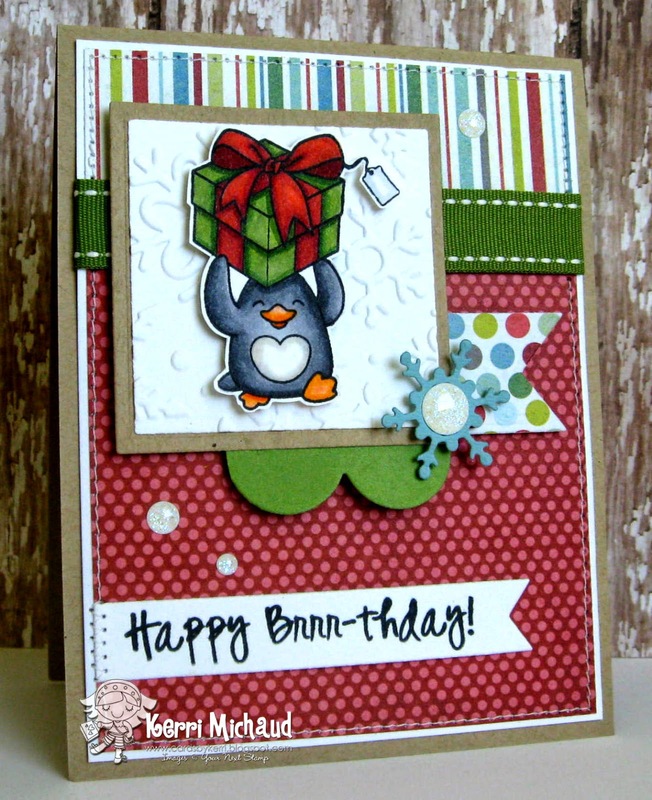 what a great penguin and mix of pattern papers! the penguin will be versatile. He's not just for Christmas. Such a great card and I really love that penguin. Love the layers on this great card. Such a cute little penguin - I'm really falling for him! Your colouring is beautiful - love your card! Such a pretty card Kerri - I love the fun colors and pretty patterned papers you selected. So cute. I like the addition of all the details. Beautifully colored card and your layout is perfect! He's adorable and beautiful card! The penguin stamp is SO adorable! Love your colouring and card! Waddles is so cute. I really like the embossing behind home and all the fun papers you used. Just too adorable and cute! Love this adorable winter birthday card! Fun stamps and great cheery colors! Great card. Love the penguin. How can someone not love the penguin?! He is so cute! Great cards! So cute! Great job on the coloring! I am definitely in love with the little penquin. Plan to order him. Cute image and wonderfully coloured. Love the embossed mat. So loving Waddles! Very cute card! I really, really love this!! Waddles is so cute and I love the papers, design and colors! Wonderful card Kerri! Great mix of colors and textures. So glad to have you back to join us, Kerri! Missed your fab creations. Thanks so much for being our special guest! !